Sign up to receive updates and special offers from Angelic Shades! I will only send my letter to you once every quarter or on very special occasions that I feel are important. Get a free download of my Lady of December coloring page (a $2.29 value) when you subscribe! An email with a link to the coloring page should arrive within an hour of your subscription to my mailing list. I DO NOT sell customer information and am dedicated to keeping your information secure and private. For general news concerning new art, upcoming appearances, special offers, etc. A letter tailored to suit the busy schedules of Art Directors looking to work with me on their future projects. You can also keep up with instant updates via my Facebook Page, Twitter, and Tumblr. Like this series? Help make it the best it can be by pledging today on Patreon for exclusive rewards! 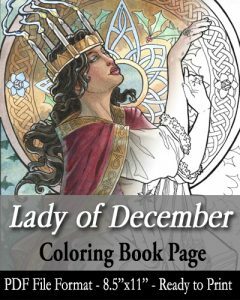 Get a FREE coloring page of Lady of December (a $2.29 value) when you sign up for my mailing list!